Blast your Friends with a ball of harmless but stinky air from up to twenty feet away. Just pull back the plunger, squeeze the pod release, aim and fire. 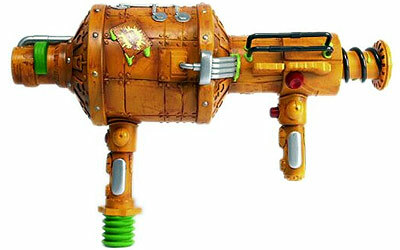 The Stink Blaster Blaster coils the air as it races towards your target for a concentrated blast of air and smell. The power of the air ruffles shirts and blows hair, while the smell will wrinkle noses and annoy your friends. Blast them from a distance, they'll never see you coming. The ultimate in stink prank play, the stink toy is smelly wind blowing fun. The toy comes complete with blaster and two stink pods.